The Overview page of your AT&T Office@Hand account displays the Messages, Favorites, Contacts, Call Log, and Settings tab. 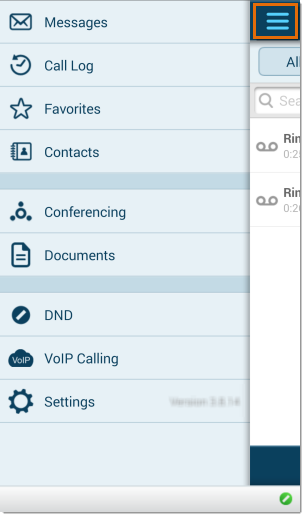 Launch your Office@Hand mobile app on your Android device. Tap Menu located at the top left corner. NOTE: Once Menu is tapped you will now see the Menu page for AT&T Office@Hand. You have just opened the Menu page of the AT&T Office@Hand mobile app for Android.